What the heck happened to my Yahoo mail? I logged in to Yahoo mail today and apparently I have been given the sneak preview for a new design. They must be testing to see how users like it. 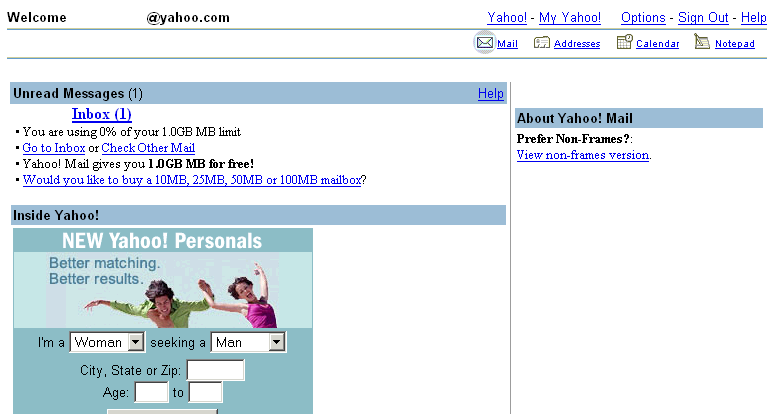 As you can tell, Yahoo has decided that their new design should look and act like a website from 1995. I’ve logged into another Yahoo account and it’s perfectly normal. So WTFreak happened to mine? Clicking to view inbox (which has messages in it) shows me no messages at all. Anyone know why? It does it in Firefox, Opera, and IE. Jess June 15, 2005 at 10:47 PM You know, sometimes I’ve logged into yahoo and seen a totally different layout. And I think, hmm. They’re changing stuff. But then the next day it’s back to normal. Nothing I’ve seen looks that bad though - wow.